Ok I admit it. Frankly I got sick of hearing the WWPD podcast interrupt their stellar Flames of War coverage with all this yammering over some ‘Saga‘ thing. So I finally broke down and decided to take a look at it for myself. Now I should mention that, except for a somewhat recent foray into Napoleonics, I have had little to no interest in gaming much prior to WW2. But of course like many interested in military affairs, I have spent a bit of time looking at the Roman era and later Medieval periods but the Dark Ages certainly held little appeal. Well, weakened as I was from my self exile from 28mm gaming by Dust Warfare, this decision probably came at a bad time. Saga turns out to simply be a great set of rules. It quickly transcended any lack of interest I may have had in the period and sucked me in. So now my new Battlefront M4A3E8s sit idly aside as I once again pick up yet another range of 28mm miniatures. The WWPD have done a great job supporting Saga and they now have an entire site dedicated to the game called The Tapestry. The Meeples and Miniatures podcast has also devoted two shows to Saga that cover the rules and the new Northern Fury expansion. They also have a written review covering the basics of the game. 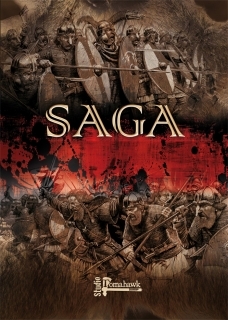 The Wargamer blog has done a nice Saga review. The Life and Times of a Wargames Butterfly blog has another Saga review. Those sources should provide you with all you’ll need to decide if Saga is for you. I had originally intended this post to be a primer on how to get into Saga because it took a bit of digging for me to settle on forces. But once again WWPD has done a great job and they have a wonderful post, Sourcing Saga, that outlines most of the miniatures available for Saga. But of course I couldn’t take the simple route and go with the standard Norman forces. I had a box of the Perry Men at Arms hanging about so I decided to proxy the Norman forces using later Middle Ages period forces. This also demonstrates a strength of Saga. There are eight official Dark Age forces now with certainly more on the way. But fighting with shields and pointy sticks is rather similar across the years so one can easily adapt (or simply proxy) forces for Saga from 300BC or so right up to the 1400s AD. Firearms are probably not well suited for the rules but almost any melee actions are quite doable. I suspect we will see Saga officially expand into later periods as well as visit the East and the Samurai at some point as well. Roman Period – One need look no further than Warlord Games’ Hail Caesar line of figures. Thankfully many of the core forces are in plastic and all very well done. There are of course the Early Imperial Romans themselves as well as the other forces of the period. Gripping Beast has metal Romans. 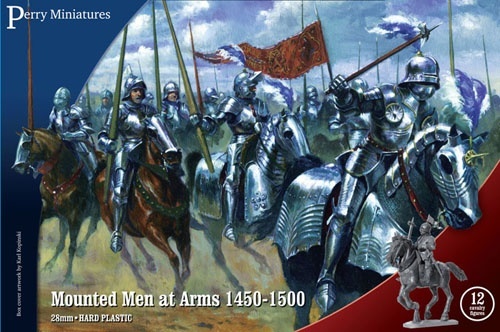 Middle Ages – Perry Miniatures has a great plastic War of the Roses line with Mounted Men at Arms (mounted knights), Mercenaries (useful for crossbow troops) and War of the Roses Infantry (bow/spear armed troops). Perry also has the metal Agincourt line. Gripping Beast has its metal Later Crusades-era line. Fireforge Games has a new line of mounted knights with their Teutonic Knights, Templar Knights, and Mounted Sergeants plastic box sets with more on the way. Samurai – If you want something really different you can try your hand at Samurai. The Wargames Factory have their plastic Rising Sun Line that looks very good. Again Perry Miniatures have a metal range of Samurai. Zenit Miniatures has a new line that will be released soon of fantasy Samurai for their new Kensei game. They are 30mm so may or may not mix well with other lines. Perhaps due in some measure to the success of Saga, Dark Age terrain options have increased as well. 4Ground have a line of excellent pre-painted buildings useful for Saga. WWPD has another look at 4Ground buildings. Architects of War have some buildings and misc terrain. Warlord Games have some options as well. If you like a good, fast playing game with some real tactical nuance give Saga a try. If you don’t want to start collecting another set of 28mm miniatures you better just move along…and whatever you do DON’T pay any attention to the WWPD and all their Bolt Action talk!!!! Oh no, my wife is gonna kill me…. Also see the official Saga forums. This entry was posted in 28mm, Dark and Middle Ages, Saga.